Cody Hoopes of Redmond, WA. capitalized on a front row starting spot and lead the Buzz Inn Steakhouse Stinger Nationals to a wire to wire victory in the 50 lap main event. Meanwhile, Chad Fitzpatrick out muscled champ Roger Drake to earn the top spot by a fender for the Les Schwab Street stocks in what was surely the best race of the year so far. Hoopes qualified number two, earning the front row starting spot in the Nationals and never looked back as he led every lap. It wasn’t easy though as Bryce Kolar making his first Stinger 8 start of the year gave virtually all of the leaders fits as he refused to yield his Honda at the intersection for any and all conditions, breaking up the pack of racers dicing for position on a regular basis. Kolar brought the crowd to their feet time after time with his heroics, sending the leaders scrambling for a clean pass through the cross roads. The top ten settled in to position by lap thirty and spent the remainder of the race threading the needle. Nicole Pollard trailed Hooped the entire distance, closing to within striking distance in the closing laps, but had to yield one last time inside of 5 to go and the race was settled. Jessica Gray, Matt Somerville and Lance O’Grain rounded out the top five. Roger Drake sailed into the lead of the Street Stock main from his second row starting spot to lead the first lap, the beneficiary of an attempted jump by front row starter Chuck Richard. When Richard attempted to get the jump, pole sitter Kenny Erickson didn’t bite, and Rickard ended up costing himself five positions by the end of the first lap. Fitzpatrick settled into second by lap 12. A lap 25 caution bunched the field together, giving Fitzpatrick a shot. As Drake brought the field down for the restart, Roger went first, but hazed his tires and Fitzptrick capitalized, leading the field into turn 1. Out of four for the White flag, Fitz slid up a groove allowing Drake a look inside. Drake lead down the back stretch, and Fitzpatrick inched ahead going to three. Virtually even through the final turn, Fitzpatrick had enough momentum on the outside to nose ahead of Drake by half a fender for the finish and claim the win. Darrell Lutovsky claimed the final podium spot in his first run of the year at Evergreen. Chris Curtis took home the 30 lap Outlaw Figure 8 main, while Scott Hunt claimed the Hornet main event on the 3/8 oval and Trenton Moriarity led every lap of the Mini Stock main event to remain undefeated in his campaign to defend his championship rookie season. Saturday night is Driver Reunion night at the speedway so there will be lots of special activities along with the Super Late Model 75 and Outlaw Compact open competition event with well over 40 entries expected. Summer Showdown is on the docket for the end of June as the summer heats up at the historic facility. 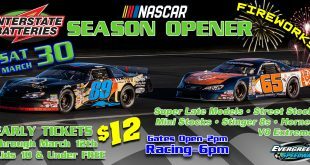 You can get tickets for all these events by visiting www.EvergreenSpeedway.com.